Government officials have introduced a temporary car ban in Paris to combat air pollution. The air pollution in Paris has become so bad that the French government has introduced a temporary driving ban. The new rules, which went into effect Monday morning, aim to cut back Parisian traffic by roughly 50% in order to help clear the air. Drivers with license plates ending in even numbers are banned from the roads Monday, while cars bearing odd-numbered license plates will be banned Tuesday. Pollution levels in Paris have reportedly intensified in recent days due to a combination of warm, sunny days and cold nights, which keeps pollutants from dissipating. 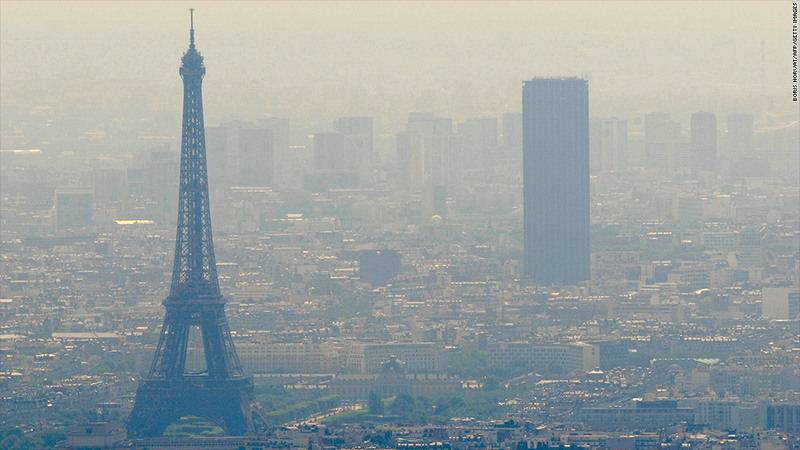 According to some reports, parts of Paris at certain times of the day have had worse air quality than Beijing. But environmental data from the European Union and other online tracking systems show the air quality in Paris is generally significantly better than Beijing and other Chinese cities that have recently reported high levels of pollution. The French government said the alternating car ban was agreed upon after Prime Minister Jean-Marc Ayrault consulted with ministers responsible for the interior, environment, health and transportation. "The Prime Minister is aware of the difficulties this could create for Parisians, but this extra step is required," the government said in a release. All public transportation in the city -- including trains and buses -- has been free since Friday as officials try to encourage environmentally friendly travel, though that free travel is set to end Tuesday. Canadian tourist Jon Ward visited Paris over the weekend and said the city looked smoggy and hazy, but he didn't notice any problems with his breathing. "Then again I'm from Toronto so I'm used to terrible air quality and smog!" he said. Ignoring the car ban will cost Parisians, who could face a fine of €75 ($104) and possibly have their vehicle impounded. The alternating car ban also applies to scooters and motorcycles, though electric and hybrid vehicles won't be affected. Carpool cars containing at least three people will be exempt. Government officials said they will evaluate on Monday evening how long the traffic ban could be in effect.